This was just two months ago, but the disaster was not real. They and dozens of other communication professionals, journalists and air safety officials were at an industry conference on crisis management; table-top war gaming a disaster hoping to be ready for the unimaginable. I was there with them in the mock disaster. I'd been asked to attend by the International Air Transport Association given my experience covering the disappearance of Malaysia Flight 370 for ABC News and my forthcoming book on aviation mysteries for Penguin. It was nightmarish working with these airline executives that afternoon and we knew we were just play acting. Now that it is real, I can't imagine how they are coping. Their boss, Air Asia chief executive Tony Fernandes calls the disappearance of QZ8501, "my worst nightmare." No doubt it is theirs' too. As of this writing the Airbus A-320 en route from Surabaya to Singapore has been missing for 19 hours. It disappeared after the pilot radioed for clearance to change course to avoid weather. News reports say there were no further calls from the cockpit. What happened? Like a reoccurring bad dream this question is back for the third time for a Malaysian airline. What makes this event different is how Air Asia is avoiding the missteps taken by its larger, legacy competitor. Fernandes immediately took to Twitter, confirming a loss of contact with the plane, re-tweeted the airlines fact-packed statement and got himself on a plane to Indonesia - home to the majority of the passengers and perhaps the flight crew as well. To answer the "what happened?" question requires time and patience neither of which is found in abundance in the population at large. And it cannot be expected from those who had loved ones on the flight. Malaysia learned this from the hammering the airline and the government took for the stonewalling followed by confusing and contradictory statements after Flight 370 disappeared March 8th. Air Asia has learned too. It is not holding back when it comes to telling what it does know. What to tell? Well, in this case and with any commercial aviation accident, there are many, many, many known facts. Everything about the age, history and maintenance of the plane, the experience and performance of the flight and cabin crew, nationalities of passengers and operations at the airport and along the flight path. Air Asia has so far done an impressive job in putting these tidbits out there to feed the worldwide appetite for information. This is to be applauded because prompt and accurate communication right from the start helps establish trust between the public and the families and the airline and the safety officials. Acting with integrity and displaying concern is the most effective way to minimize hostility and prevent wild speculation. Both of which lead to conspiracy theories and conspiracy theories never die. If past is predictive, investigators will find out what happened to QZ 8501 and that information can be used to make flying even safer. The link is that direct. 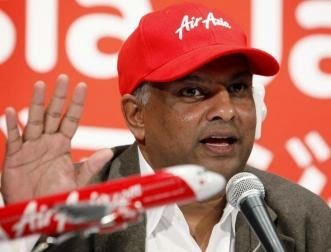 So spend time on Facebook Air Asia, tweet what you know as soon as you know it @tonyfernandes, and don't be afraid. The worst has already happened. If you handle it right, you can elevate Air Asia from the depths to which Flight 8501 has fallen.